Beautiful! Taking note of all your mods. A pretty silk print is not to be passed over, they’re hard to come by. 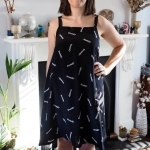 I’ve been waiting to see this dress made up – excellent result! Mood has excellent silk prints, such a great selection, and so much cheaper than here in Canada. You scored with the stars, they are awesome. 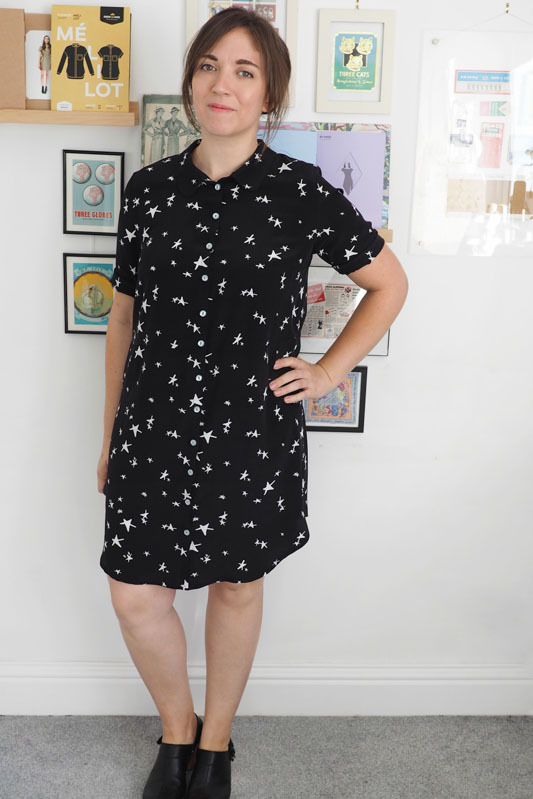 The sewing list for 2016 is jam packed, but I’ll have to find a way to squeeze this one in! This is fantastic Katie. A perfect match of pattern and fabric and it looks so “you” as well. I wasn’t sold on this pattern but you might have changed my mind. Love this! Great fabric choice too! Gorgeous! 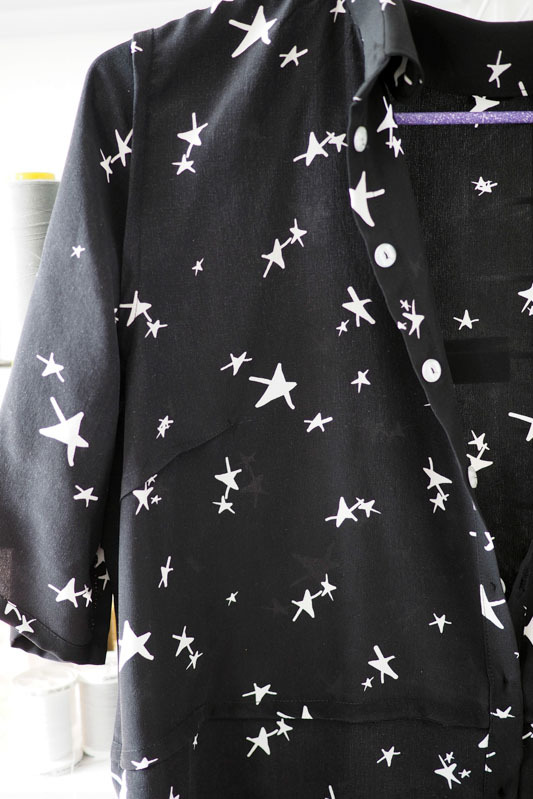 I love that fabric so much, I’ve never found a starry print that I’ve liked. I really like your mods too, the full length button band looks great. 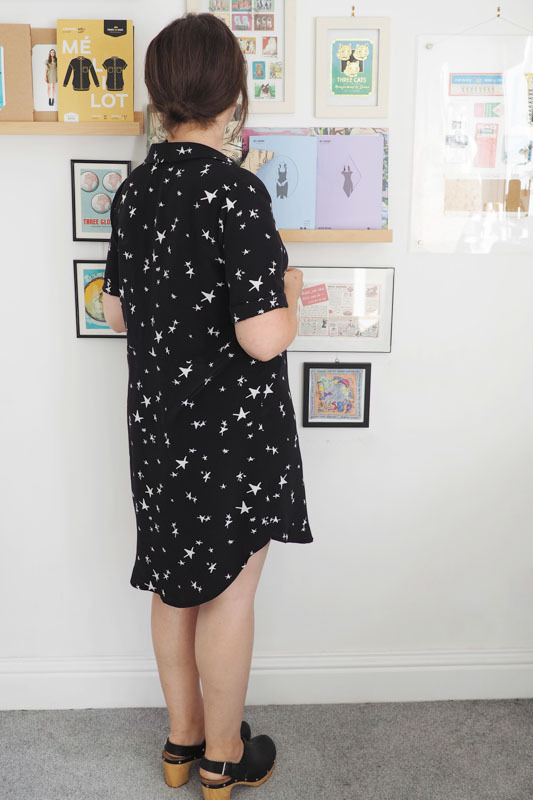 I love it too because it’s more abstract and scribbly – I don’t like straight/regular star patterns! 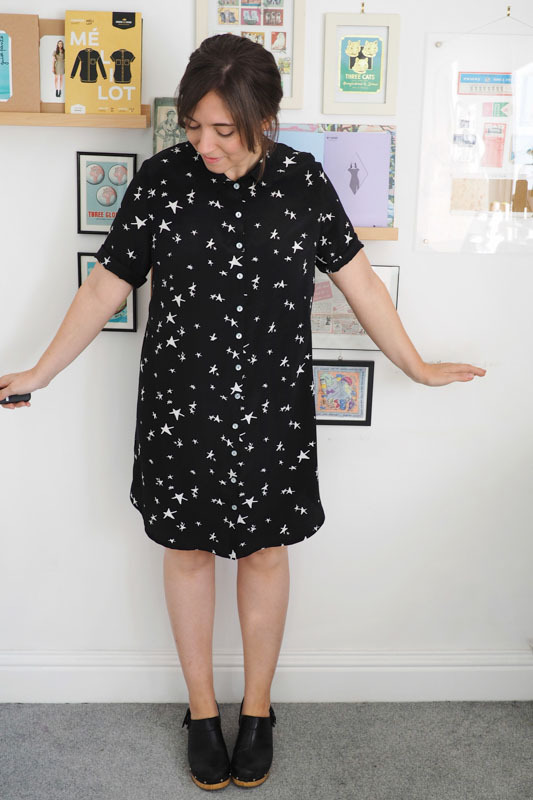 Very nice – it’s going to be a very versatile frock! I was hoping you would do the Helmi and I had my fingers crossed you’d make some mods, like swapping the collars! 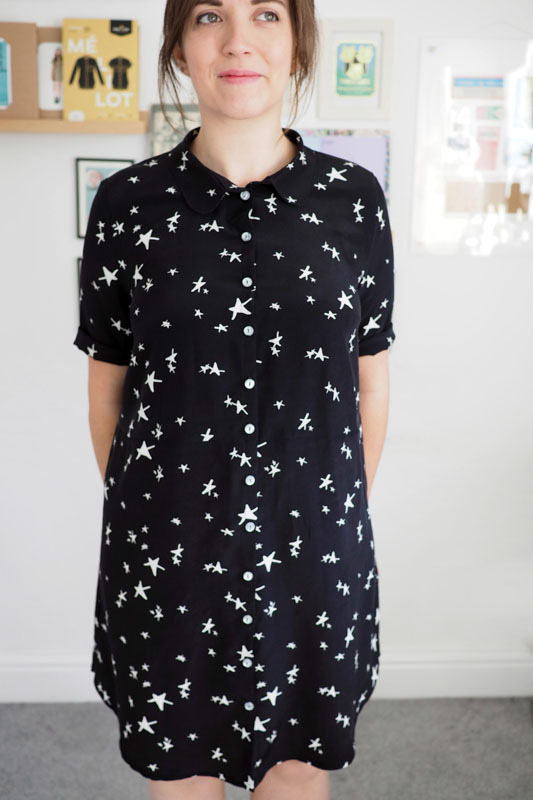 I love your version of this dress – was it straightforward to substitute the collars? Oh yes, they’re 100% interchangeable as the bodices are the same – you can just choose which you’d like. Looks fantastic! Is that full length button band also functional or partly decorative. I notice the pattern has a skirt and bodice, with the placket only functional for the bodice. 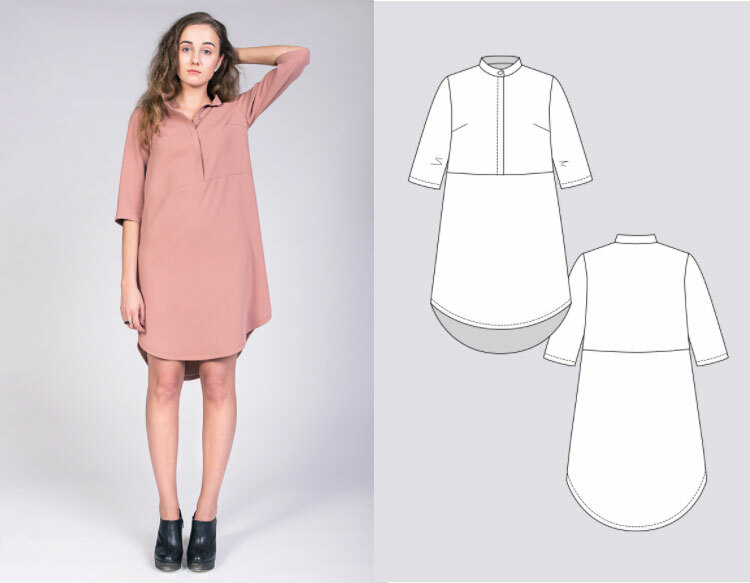 Did you create more of a shirtdress style?? It’s functional in that it’s real buttons/buttonholes all the way down, but you can definitely still get it on and off by just buttoning to the waist! Love this – it looks great on you. I have almost bought this pattern a few times! I think yours is the first I’ve seen made up, might need to take the plunge. 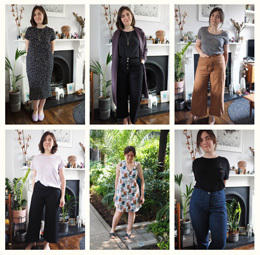 They’re ace – I can even cycle in them! It is all of the above for sure – I need more! Another gorgeous make Katie!! I love it and that fabric!! I’m swooning once again. I also think it looks fab with your clogs. I’m excited to see your shirt version too! I love how this turned out. It looks amazing on you! After seeing how you recreated the Helmi I was encouraged to purchase the pattern. I particularly liked the way you continued the button placket the entire length of the front. I know it has been a while since you made this however, I am wondering if you can offer some advice for how you did this? 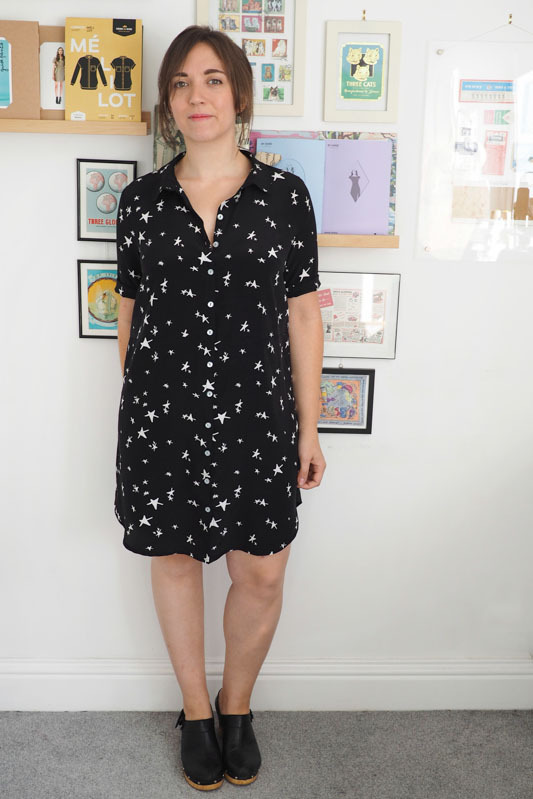 Hi Sally, you basically want to cut the front skirt as two pieces rather than on the fold, and add on the same width as the bodice button bands so they match up. Then you’d sew each side of the bodice to the corresponding skirt piece and press/sew the button band along the entire length of the dress. Hope that makes sense. I love this dress, you look great! 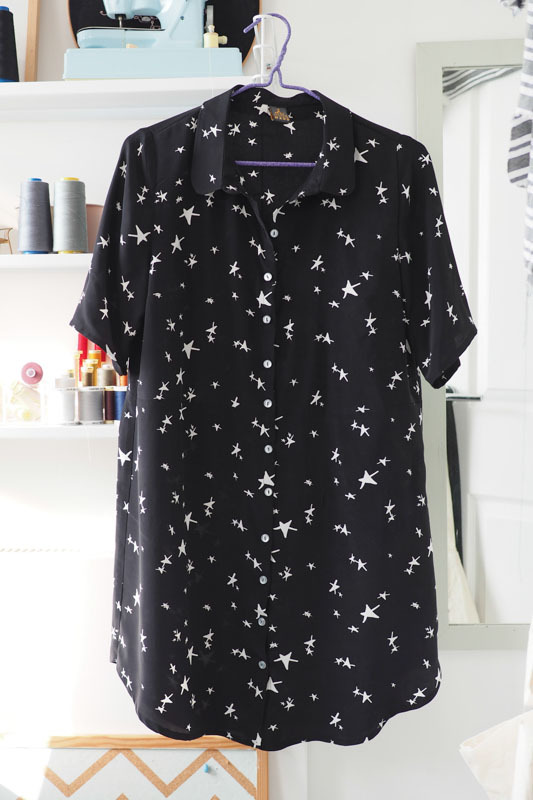 I would really love to make this dress but like you I would not want a concealed button packet, was it easy to just make it a normal button band?